I always find my most, creative thoughts in the steady beat of repetition; this is my idea of peace. Long steady-state rows, runs, bike rides and even walks provide my brain with the white noise that it needs to clear through the chaos of everything and find inspiration. In 2007 in Beijing, I learned the wisdom that accompanies making time for doing nothing. That year I went to China 5 times helping Canadian athletes and teams familiarize themselves with Beijing and the sports venues that would host the 2008 Olympic Games. I became quite the tour guide of the Great Wall, the Silk Market and the Forbidden City. 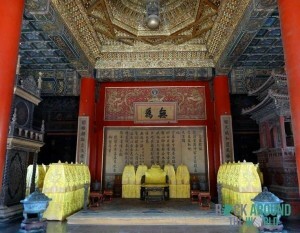 The later, the Chinese imperial palace, was where the Emperor (and Empress) lived and presided over court. It is also where first became aware of the Confucius phrase Doing Nothing. In the Forbidden City there are 9 palaces each with a throne room and above each throne a Confucius phrase is written in beautiful calligraphy. Above the throne in the Hall of Union and Peace the phrase translates to Doing Nothing. When I heard this – I giggled; wondering what Emperor wouldn’t want to hang out there? I was quickly taught what Confucius had meant by this and why this particular phrase had been hung there. This palace was an important one and as such, important decisions were to be made from that throne. The idea of Doing Nothing was instructing the Emperor to settle his mind and to clear through the chaos of all his other responsibilities so as to create clarity. In the wake of Doing Nothing an Emperor should find the inspiration for creative and wise thought. It was a super cool concept; there was so much wisdom to removing the limits of a cluttered mind. The modern idea might be if you stop multi-tasking so much you might have a better chance of thinking outside the box. While pregnant, walking our dog Bernice had been my favourite doing nothing time. For a few months anyway, I could still calm my mind enough to develop ideas that I wanted to put some flesh on and write about. As a new parent pushing the stroller, grateful that Izzy would nap and give Bernice and me a calm and quiet hour it became more like a zombie walk. While I may have achieved some calm/quiet on the walk, I wasn’t even close to clarity, creativity or wisdom. I could find no path through the chaos of my exhausted brain as it was constantly working on how-to-parent questions. And not only were there no ideas streaming out, I was struggling for any to come in. For the past 6 months a big joke (and a big waste of our money) has been the daily newspapers and magazines that come to our door. Pre-baby – after walking the dog and working out, the papers were read by 10am while savouring my coffee. That whole routine was the first to go: my comprehension was also out of focus. Thankfully now, the initiation phase of being a new parent is coming to a close; we are catching our breath and finding our stride. So; if I want some creative thought back, I need to accept that parenting is lovely and will always be hard and challenging. It’s time to stop waiting for the chaos of our busy lives and the accompanying fatigue to completely go away. In some ways parenting (depending on how you parent) is way harder than going to and winning at the Olympics, but this isn’t just a parenting/exhaustion issue. Chaos, fatigue and disturbed peace, with no opportunity to Do Nothing, are constants in our multi-tasking lives. To find opportunities for creative and wise thought we have to stop waiting for the chaos to go away – because it won’t. We have to stop waiting for our fatigue to go away because, chances are, even if you get some rest – it will come back. Once we embrace and anticipate the world as it is; full of change, long days and new challenges our mind can stop struggling against the chaos and can be inspired within it. I think this is when and how a modern Confucius would suggest that we could Do Nothing. Now Isabel is almost 7 months. She is entertained by and interested in her toys and herself; learning to crawl requires a dedicated effort! Bashing a rattle on the floor is fascinating stuff! She naps and sleeps better and thus so do we but we’re still tired. We’re still learning; every milestone presents its own new chaos. As I come to grips with this new normal– the tripartite exhaustion seems to be lifting and my brain seems to be coming back on line. I haven’t written and/or posted anything about being a parent yet. I suppose I should have written a few pieces about how amazing it is being a parent before this one…even a simple introduction to Isabel Maxwell Shelly-McBean might have been nice. But where she had inspired me to want to write… I was limited by my exhausted brain and couldn’t. Now I’m finding that I have things I want to say, and I want to discover some creative ways to say them. Izzy seems on the verge of decimating Bernice’s peace too. Who knows…maybe this moment where I can Do Nothing and find my thoughts again will be short lived. 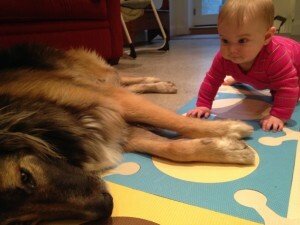 I’m told once Izzy is crawling my ability to be still and think gets decimated all over again! Apparently Confucius didn’t spend much time parenting. Next up… Finding solutions to problems, not problems to solutions. Marnie, thank you for this blog. Your radio silence has been noticed and missed. As a business coach, I find that many of my clients are stuck in a vortex of stuff. While this isn’t the same as parenting, the anxiety level can be the same. To your Confucious quote, I try and get my clients to focus on less and this will allow them to do more. We create our own vortex by trying to take on too many things. By slowing down life, we can find creativity and peace. Thank you for this blog and welcome back. Maybe Confucius said “Doing Nothing” because the paper inside a fortune cookie only allows for 20 characters or less. Also, we’re going to China in November–and, after reading a less-than-flattering memoir of Troost’s time in China, I appreciate your slant. And, this is where I don’t say that I just woke up after a 10-hour sleep, right?